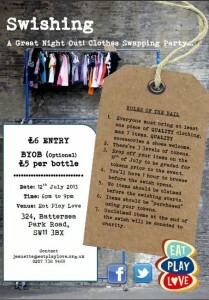 It’s just a few days to go until Battersea’s first Swishing Party at Eat Play Love Café. Battersea locals are encouraged to root around their wardrobes and bring along their quality clothes, shoes and accessories and exchange them for somebody eles’s Hidden Treasures! Swishing is shopping without the hangover of a big credit card bill. We all bring nice, clean, presentable clothes that are lurking unloved in our wardrobe, and other girls fall in love with them and give them a good home. You might bring one sweater and take two pairs of shoes, or hang a party frock on the ‘Swishing Rail’ and take a pair of skinny jeans and feather boa. The party is hosted by Eat Play Love, Battersea’s newest yummy mummy café offering a safe and relaxing environment for everybody, but particularly those with young children to come and enjoy good coffee, home-made nutritious food and finish a conversation while the children can play and roam in the free play area. 1) Everyone must bring at least one item of quality clothing (max 7). Tokens will be given. 2) You will have 1 hour to browse before the swish opens. 4) As soon as the swish is declared open, everyone may take what they want and pay using their tokens. This entry was posted in Battersea, Wandsworth Events and tagged events, party, swishing by Blogger. Bookmark the permalink.